Nicola Bertoni grew up in Washington, D.C., where she began studying classical music from a young age. She eventually went on to pursue a Bachelor of Music degree in vocal performance at James Madison University in Harrisonburg, VA, where she first discovered her passion for choral music and conducting. After JMU, she began her graduate coursework at Westminster Choir College in Princeton, NJ, where she earned her Master of Music degree in choral conducting under the tutelage of Dr. Joe Miller and Dr. Amanda Quist. 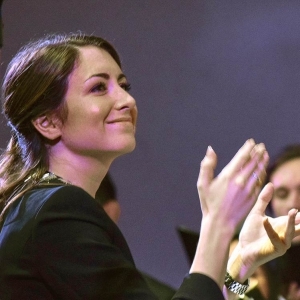 While at Westminster, Nicola served as the graduate conducting assistant of the Westminster Chapel Choir, an ensemble comprised of undergraduate students in their first year of study. Also during her time at Westminster, she sang in the internationally-renown Westminster Choir, the Westminster Symphonic Choir, and Kantorei. Through her participation in these ensembles, she performed frequently with the Philadelphia Orchestra and the New York Philharmonic under the batons of Yannick Nezet-Seguin, Alan Gilbert, Daniele Gati, Vladimir Yurowski, among others. She also spent two summers as a member of the choir-in-residence at the Spoleto Festival USA in Charleston, SC. Most importantly, a winter Westminster Choir tour down the coast of California caused her to fall in love with the West Coast, and more specifically, Southern California. Nicola is currently on faculty at Fullerton College as a Choral/Vocal Assistant Professor, where she directs the Concert Choir and the Women’s Chorale. She also teaches applied voice lessons and music theory. She is an active choral clinician and adjudicator for regional high school and middle school festivals. She has a passion for cultivating music literacy in her students while also encouraging healthy, informed vocal technique. She is delighted to live and work in Fullerton amongst wonderful colleague and students, and is looking forward to the many exciting semesters ahead.